What better way than to tie the knot on the beautiful island of Maui in Hawaii? With Out Of Office, we will tailor your wedding according to your requirements. Celebrate your nuptials on beautiful Poolenalea Beach, a secluded location, in beautiful Wailea. Then stay on the island for your honeymoon. You can choose from a traditional Hawaiian service, a Christian service, a spiritual ceremony or a civil ceremony. 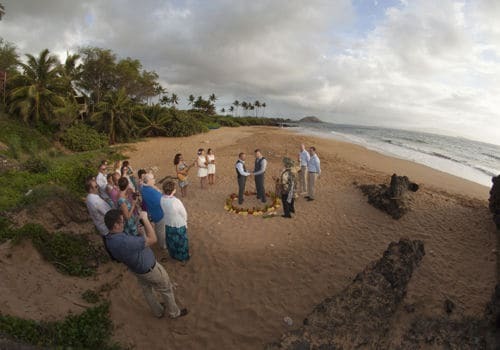 Our favourite location for a wedding ceremony in Maui is Poolenalea Beach. It offers great privacy and there’s a beautiful path to a more secluded section of the beach. In Hawaii, no witnesses are needed and there’s no minimum stay period ahead of your wedding. This SPA complex is situated on the sunny leeward side of Maui within the world-renowned Wailea resort. At this resort, guests can enjoy 22 lush oceanfront acres. Guests can relax in one of 544 renovated and luxuriously appointed guest rooms or explore coves filled with exotic marine life. The hotel offers an array of services designed to give guests plenty of leisure time to enjoy the beauty of the island. The resort has 5 outdoor pools and the newest of these pools is an adult’s only infinity pool located near the SPA centre. Amidst swaying palms and shimmering water on four oceanfront hectares, this luxurious complex offers something for everyone. Guests staying at this property may splash their way through the magnificent 25,000 sqm aquatic playground with five swimming pools and a thrilling 39 sqm water slide. Pamper yourself with a spa treatment and massage in the Health Club and Spa or just relax on beautiful Kaanapali beach. This hotel offers luxurious accommodations with magnificent views. Each of the guest rooms and suites features a host of modern comforts and amenities, including Westin’s luxurious Heavenly Bed. Enjoy tropical drink specials, live entertainment, and authentic Japanese cuisine handmade to order by the sushi masters, champagne and jazz brunches and so much more, all under the Hawaiian stars. This luxurious resort boasts a stunning setting in Maui. The resort is located close to Kaanapali Beach, at the historical Pu’u Keke’a, Black Rock. The resort is beautifully nestled amidst 23 acres of tropical, luxurious landscape, boasting a picture-perfect setting. This magnificent resort tempts guests into a world of exotic charm and luxury. The guest rooms have beautifully incorporated Hawaiian colours, textiles and prints into the decor. Guests can enjoy a wide range of activities at this resort. The resort offers a wide range of unrivalled facilities and services, meeting the needs of discerning travellers to the highest level of excellence. Guests can enjoy delightful dining in-house, indulge in the ultimate pampering and rejuvenation in the spa, or simply lie back and revel in the sheer, natural beauty of the surroundings. Set on 16.2 hectares in a privileged position frontline to the spectacular Wailea Beach on Maui’s south-western coast, the luxury Grand Wailea Resort Hotel & Spa is surrounded by the most beautiful, lush tropical gardens. Kahului Airport can be reached within a 35 minutes’ drive. Everything about this luxury resort is top class: the breathtaking island of Maui was voted the Best Island in the World, the 4,600 m2 spa area, the largest one of Hawaii, is ranked among the top 10 spas of the United States, and the hotel itself is a regular winner of multiple awards. The elegant, luxurious rooms are spacious and boast marvellous views of Maui’s scenic beauty. The Wailea Canyon Activity Pool features 9 pools, a 600m long river with waterslides and waterfalls as well as an adults-only pool. Exquisite dining options include multiple award-winning restaurants such as the famous Humuhumunukunukuapua’a. The perfect choice for guests who demand nothing but the best.